I’m trying something new today, if you participate in Social Media you know that manufacturers often decide to share artwork or pictures of products before release. My thought is to also share it here when possible, these posts will have no set schedule as there isn’t a set time schedule for release of this kind of info. I’m considering adding an additional scheduled post every week and would like to know your thoughts, should I continue with Wednesdays and add maybe a Monday or Friday? Do you have other days you would prefer to see posts? Leave a comment and let me know your thoughts. Translation: The English translation of Fausto is happy. Additional Info: Per Pete this is the same blend as the Tatuaje T110. 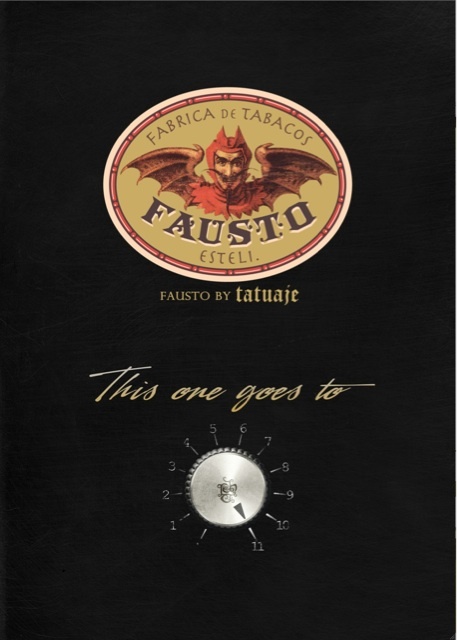 Check out the Cigar Feed, it looks like Charlie has more info on the Fausto. This entry was posted on March 11, 2011 at 9:32 am and is filed under Cigars with tags Ad, advertising, Band Art, Ecuador, Ecuador Habano Maduro, Fausto, Habano, Maduro, Nicaragua, Pete Johnson, Tatuaje, Tatuaje Fausto. You can follow any responses to this entry through the RSS 2.0 feed You can leave a response, or trackback from your own site. Thanks for the kind words Mike, sometimes this info comes out at odd times and gets missed. Many of the bands are art in my opinion i’m sure once it hits the cigar it’ll be shared with quite a few more people than the ones that visit my humble space.